Slavin’s journey home – a journey that was all part of a beautiful plan. 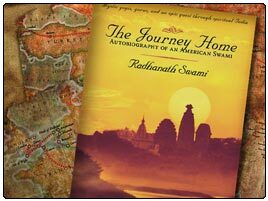 In reading “The Journey Home – Autobiography of an American Swami”, one is struck by the kind of life that Richard Slavin (Radhanath Swami) led, or rather, was chosen to lead. The events that Radhanath Swami narrates are almost the stuff of fiction, and the reader sometimes forgets that it is an autobiography! The author’s candid and clear expression, as also his courage in making public his struggles and weaknesses, are what make this narrative endearing. The reader can at once identify himself with Richard Slavin at the level of an ordinary human being, and at the same time is inawe of his superhuman determination, and his unwavering conviction in his ideals. Born into a traditional Jewish family in Chicago, Richard, from his early years, wrestles with ideas about Religion, War, Hatred, and God’s role and identity in the entire scheme of things. In order to find some answer, he makes a study of Judaism, Islam, Buddhism and Christianity, but issues still remain unresolved in his mind. His restlessness and search for a meaningful life with ideals draws him towards the counterculture of the 70’s, wearinghis hair long as an aggressive challenge to mainstream values driven bymoney, power and prejudice. minded determination, grit and tact, he travels overland, often hitchhiking, through Turkey, Iran, Afghanistan and finally reaches India. His experiences in these countries are at times spine-tingling and at other times absolutely hilarious. The narrative then takes us to his sojourn at Kathmandu, the Himalayas, Calcutta, Hrishikesh, Dev Prayag,Patna, Varanasi and finally, to his being stranded on Mathura station on the day of Janmashtami, half way through his train journey to Amarnath. His eight mile walk to Lord Krishna’s Vrindavan becomes the culmination of his journey home. never a slack moment. Richard’s reflections on these events are something that will compel readers to ponder upon and savour. Richard Slavin’s life is unique just as each one of ours is too. The kind of life that he has led sculpts an image of a man who seems larger than life yet human enough to feel pain, humiliation and fear. But what inspires the reader is the power that he receives to overcome seemingly insurmountable obstacles through patience, perseverance and prayer. His experiences plumbthe depths of human potential to reveal what an individual is capable of through sheer faith. “The Journey Home” is Richard Slavin’s transition from being the one who sought, to the one who is sought after. The book is a must-read, not only for the spiritualist but for anybody who is sensitive enough to see the miracle that Life is. Govt. College of Arts, Science & Commerce, Sanquelim. Yes this is a must read book. Awesome review too. It is amazing, Radhanath Swami is inspiring personality to every one. Generally, people are on a journey towards hellish life performing abominable acts. But this book will definitely take people to a new and happier life . It is thanks to Radhanath Swami that many people have got spiritual re-birth. Thus his book is very close to their hearts. It;s the best quote – if you don;t have something to die for, you have nothing useful to live for! All Glories to Radhanath swami. Thank you Lucy for giving the total description of the Journey Home in this article. Journey Home is a must read book by everyone. This is an adventurous book. “If a person does not have an ideal he’s ready to die for, he has nothing really meaningful to live for”..
Haribol.. HH Radhanath Swami Maharaj ki Jai! Thanks for sharing this review. The book is absolutely wonderful. I liked your point that sometimes the most important moments in our lives are not the most dramatic ones; this is very true! they should make a movie out of this!!!! Honestly written comment by Lucy James.A proper judgement is made in this comment.Very inspiring and useful.Thank you very much for sharing with us. Good appreciation. Very nice suggestion for all. All glories to the readers and the author, An American Swami, HH Radhanatha Swami. Thank you for that learned review. Thank you for your wonderful comments about the Journey Home by Radhanath swami. Thank you very much Prof.Lucy James for sharing your review about the autobiography of Radhanath Swami !